Edzard I, Count of East Friesland (Graaf van Oost-Friesland), (1492-1528): born 15 February 1462, the second son of Ulrich I, Count of East Friesland (ca. 1408-1466) and Theda Ukena (1432-1494). Edzard acquainted himself with the contents of the Bible and the writings of Luther, which led him to favor the Reformation of the church in 1519. 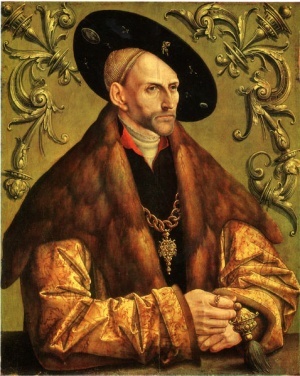 He was in touch with Luther, had his sons educated by Aportanus, who favored Zwingli, and let the Reformation of East Friesland take its course, tolerating not only Lutheran and Zwinglian influences but also Catholic clergy and extreme spiritualists, who paved the way for the coming of Carlstadt and Melchior Hofmann. Although he died before Anabaptism was fully established in East Friesland, and although his sons did not share their father's tolerance, the variety of Protestant refugees who found asylum in East Friesland, and the attitude toward them established by Edzard I, made it possible that soon after his death (1530) Emden in East Friesland became the cradle of Anabaptism in northwest Europe. Edzard died 14 February 1528 and was succeeded by his son Enno II. Hege, Christian and Christian Neff. Mennonitisches Lexikon, 4 vols. Frankfurt & Weierhof: Hege; Karlsruhe: Schneider, 1913-1967: v. I, 605. Kochs, E. "Die Anfänge der ostfriesischen Reformation" (II) Jahrbuch der Gesellschaft für bildende Kunst und vaterländische Altertümer zu Emden XIX (1916-18): 173-273. Reimers, H. Die Gestaltung der Reformation in Ostfriesland. Aurich, 1917: 6 ff. Krahn, Cornelius and Richard D. Thiessen. "Edzard I, Count of East Friesland (1461-1528)." Global Anabaptist Mennonite Encyclopedia Online. April 2007. Web. 26 Apr 2019. http://gameo.org/index.php?title=Edzard_I,_Count_of_East_Friesland_(1461-1528)&oldid=144973. Krahn, Cornelius and Richard D. Thiessen. (April 2007). Edzard I, Count of East Friesland (1461-1528). Global Anabaptist Mennonite Encyclopedia Online. Retrieved 26 April 2019, from http://gameo.org/index.php?title=Edzard_I,_Count_of_East_Friesland_(1461-1528)&oldid=144973. Adapted by permission of Herald Press, Harrisonburg, Virginia, from Mennonite Encyclopedia, Vol. 2, pp. 157-158. All rights reserved.